Showdown is Saatchi Art’s signature art competition, helping buyers identify exciting new talent from around the world. Stay up-to-date on each edition’s contenders and finalists, including your chance to vote. We are very excited to announce that internationally-renowned artist Ryan Mosley will be judging the final round of our The Painted World competition! 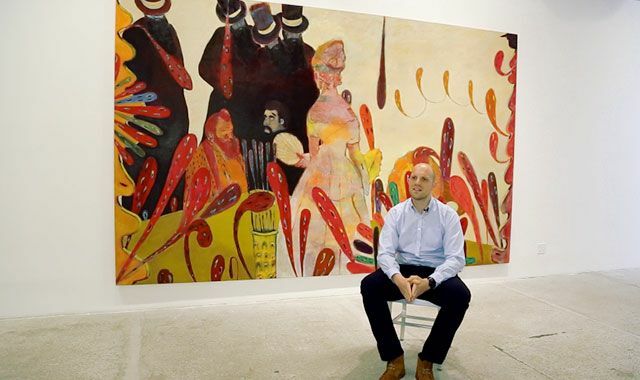 British artist Ryan Mosley creates painted worlds which fall somewhere between reality and fantasy. He is represented by Eigen + Art, Berlin and Alison Jacques Gallery, London. His work has been featured in significant group shows including Zero Hours, S1 Artspace, Sheffield (2013); Nightfall, Modem Museum, Hungary (2012); London Twelve: Contemporary British Art, City Gallery, Prague (2012); Summer Exhibition, Royal Academy of Arts, London (2012); Merging Bridges, Museum of Modern Art, Baku (2012); and Newspeak: British Art Now, Saatchi Gallery, London (2010). Mosley has an MA in Painting from the Royal College of Art, London. His work is part of the Arts Council Collection, UK, the Saatchi Collection, London, and Falckenberg Collection, Hamburg. He lives and works in London and Sheffield. After the submission period ends, the First Round of voting begins. During the First Round, the community and Saatchi Art curators vote for the 300 longlisted artists who will advance to the Second Round. Of these 300, 50 artworks are selected exclusively through the Community Vote and 250 are selected by Saatchi Art curators. The 50 works from the Community Vote are those receiving the highest average ranking during the First Round. The curators finalize their selections after the results of the Community Vote have been determined so as to ensure no overlap. During the Second Round, a jury led by Rebecca Wilson, Chief Curator and Director of Artist Development of Saatchi Art, selects the 30 shortlisted artists whose works will go through to the Final Round. The Final Round of judging is done by an internationally-renowned artist, such as this Showdown’s judge, Ryan Mosley, who will choose the ten finalists, including a winner and a runner-up. It’s important to remember that Showdown is not a popularity contest in terms of who can manipulate social media most effectively. What the Community Vote provides is a chance for the community to voice their opinions. Ultimately, the winner is determined by the judge who chooses works from among a highly-selected pool of art. Many thanks to those who have submitted entries and all those who participated in the Community Vote. The winner and runner-up of The Painted World will receive USD $1000 and USD $500 respectively. Saatchi Art is delighted to present Showdown: The Painted World in partnership with Ace Hotel Downtown Los Angeles. On February 5th, the works of the 30 artists shortlisted for Saatchi Art’s Showdown Prize will be digitally projected onto a giant display Upstairs at Ace Hotel Downtown L.A. during a special one-night only event held at the hotel’s rooftop bar. During the event, the names of the winner and 10 finalists selected by judge Ryan Mosley will be announced. This event is free and open to the public (21+). For more information or to be added to the collector invite list, please contact Nicole Garton at nicole@saatchiart.com. Best of luck in the remaining rounds!